When I post a photo of my bookshelf, I always invite comment to see which books interest people for future columns. The ones that inevitably interest people are the ones most read. Batman Knightfall is a big one (and coming in time for the 25th anniversary of the breaking of the bat.) So is Batman: No Man’s Land, in no small part due to the unusually high grade imprimatur of writer Greg Rucka. But none approach the interest this one draws. I’ve talked to so many people who immediately jump to this book. 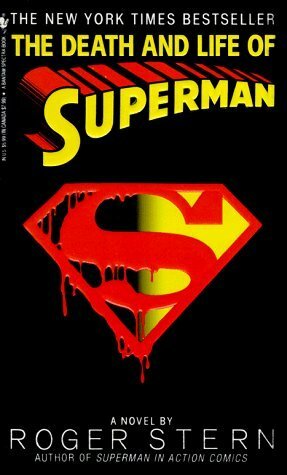 Roger Stern’s dense, epic length take on The Death of Superman seems to have been a huge flashpoint for readers. I’ve even met people who cited this as the reason they got into comics. I have to admit I was hesitant to write on this. I’ve covered my thoughts on the original story. It’s brilliant and the novelization captures why. I didn’t know if I had anything more to say beyond rehashing those thoughts. But I have to wonder what it is about this book that hit people so hard. For starters, there is the book itself. The Death and Life of Superman comes from comics writer Roger Stern, making his prose debut. Stern is one of the great workmen of comics. His “achievements” list isn’t very long with the Eradicator and the Hobgoblin two of his only notable creations but Stern’s the kind of writer I love. He knocks out a solid tale every time without frills. That’s what he does here though not without some smart touches. For one thing he frequently stops to fill in backstory through flashbacks. There’s a lot of complicated material to stop and lay out and it’s done quite neatly. He also judiciously edits out the worst parts of the stories. There’s not much of the Bloodlines annuals for example. But perhaps the best thing he does it just gets the material in order. This is a very well structured book. Really, this is an epic read. At 526 pages, small type in paperback, this is a dense book. The book jumps between multiple perspectives and covers a decent period of time with two major setpieces, the death and of return. Between we get a series of really great scenes with Superman’s rich supporting cast. Did you think you’d care about Bibbo Bibbowski? You will. Steel really gleams here. And Lois Lane, as always, is just the best. That size is really the best thing about this book. The pacing is immaculate with so much ground to cover and yet so much time to feel. I really can’t stress how important it is that Stern nailed this. Translating comics to prose isn’t nearly as easy as it sounds with more than a few mediocre or even useless reads. (The Countdown novel pulls off being worse.) Stern pretty much sets the bar for it and this in what is, just to be clear, the very first time a (major company) comics story was adapted directly to prose* and his first novel. Well done. Does the book have a flaw? It’s the same one all versions of this story have and can’t escape. Frankly the third act is just awful and I don’t think I realized it until this reading. It’s not that the resurrection was a bad idea or the method was terrible. Both were great actually. It’s the threat of Mongul, a nonentity of a villain who hasn’t been a major threat before or since. This was a good time to use Brainiac or even the admittedly complicated in status Lex Luthor. There’s just not enough here, especially compared to the power of the first act. Stern tries but he can’t fix this. Still this is a hell of a book. In fact I can say having evaluated every telling of the story save for the Young Readers adaptation, this is the best version out there. Better than the (first) DTV movie. Better than the radio drama. And yes, better than the comic. If you’re going to read the full story, this is the way to go. So why do I think this version is so remembered? Well I have a theory. This is the version most nonreaders, myself included, encountered first. It was easy to get our hands on in libraries and especially bookstores. I mean this was the kind of book sold at grocery stores. It was a cheap, easy to access way to get the whole story. The paperback was $6 compared to a minimum of 35-40 to get the original trades. And frankly for a lot of people who didn’t read comics but were curious about the hype, it was an easy way to get the story. Whatever the case, this story was repeated almost verbatim with Batman. I’ll get to Knightfall later but I feel like its existence speaks to the impact this left. A great event captured in a great novel. *Elfquest had a trilogy of direct adaptations.